Anyone pining for the return of the Premier League after the international break is going to be spoiled this week. Fifteen matches take place over five consecutive days of English top-flight action - meaning there are plenty of decisions to be made for fantasy football managers. The volume of Premier League matches on the horizon means, in some versions, it is classed as a 'double gameweek'. All the top bosses, of course, are already fully aware of this. And, if you're not, then you should be. Ten sides, including Manchester City, Tottenham, Manchester United and Chelsea, play twice between Saturday and Wednesday - which means you might want to load your team with players who have two chances to rack up the points. But you don't need us to tell you it might be worth bringing in Sergio Aguero, Harry Kane, Eden Hazard or Paul Pogba. If you're eyeing up Manchester United players then it might be worth steering clear of their defenders. Ole Gunnar Solskjaer's team, who host Watford on Saturday, have only kept two clean sheets at Old Trafford this season (only Fulham have kept fewer), while Wednesday's hosts Wolves have scored 17 goals in their past seven home games. Likewise with Tottenham. Spurs have kept just one clean sheet in nine matches - and go to free-scoring Liverpool on Sunday. Obviously Kane, who has been involved in four goals in four Premier League appearances at Anfield, is a go-to man at the other end of the pitch, although you might want to drop (if you haven't already) Son Heung-min. After a run where he scored 11 goals in 12 games between December and February, he has failed to score in his last five. Is Higuain going to prove to be a flat-track bully? Chelsea and Crystal Palace players could be particularly attractive because they are the only two sides to play twice this week, as well as the following weekend, in a period in which fixtures have been reshuffled because of the FA Cup semi-finals. Chelsea's patchy form means it is difficult to predict how they will fare, although games against Cardiff and Brighton - both in the bottom six - could be where Gonzalo Higuain shines. 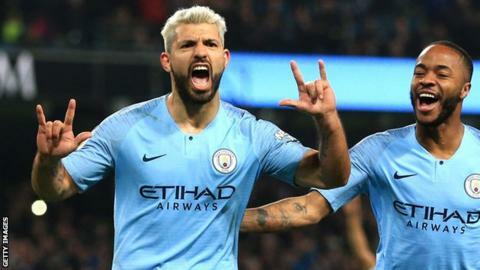 The Argentine striker has scored three goals in his seven league games so far, with all of them coming against teams in the relegation zone - two against Huddersfield and another against Fulham. Despite having only kept one clean sheet in the past five league games, those fixtures might mean it is worth another look at Blues defenders. Cesar Azpilicueta, David Luiz, Marcos Alonso and Antonio Rudiger are all ranked among the leading defenders in terms of contributing to clean sheets this season. Palace-wise, Jeffrey Schlupp could be an option. Schlupp has been operating as a left winger for the Eagles and has teed up three goals in his past four league games. And, because he is considered as a defender in some fantasy football games, the Ghanaian could bring in a load of points if Palace rediscover their ability to keep clean sheets. Will squad rotation prove to be the 'enemy'? Loading your team with players who could play twice is fraught with danger - because of FA Cup semi-finals weekend. City, along with Brighton, Watford and Wolves, have two league games in the next week and then go to Wembley on 6/7 April. Not only does that mean there is a decimated fixture list where eight teams don't play next weekend, but this weekend could also see what many fantasy football managers describe as the 'enemy' - squad rotation. We all know Pep Guardiola likes a tinker as he juggles the demands of going for the quadruple, but goalkeeper Ederson is always a safe bet having played every minute of City's 30 league games so far. Defender Aymeric Laporte, usually a guaranteed pick as the left-sided centre-back unless injured, and midfielder Bernardo Silva are just behind the Brazilian in terms of most minutes played in the league this season. Brighton manager Chris Hughton's selections, however, are usually much easier to predict. And Hughton only made one change between a league match against Palace and the quarter-final against Millwall eight days later. So the core of his team - particularly goalkeeper Mat Ryan, defender Shane Duffy and striker Glenn Murray, who have all scored well this season - may be worth considering. Wolves boss Nuno Espirito Santo is known for retaining the same team as much as possible, meaning it is likely to be worth sticking with Raul Jimenez, Diego Jota and Matt Doherty - those old fantasy football favourites. Watford do not tend to make many changes either, although Javi Gracia did decide to rest many of his first-choice players in the league game before their FA Cup quarter-final win over Crystal Palace. So it might be a risk picking Gerard Deulofeu, even though the Spanish forward has had a hand in six goals in his last four Premier League games - four goals and two assists. Load up on Arsenal players? Arsenal playing Newcastle is guaranteed to yield plenty of points for the home players - according to the stats. Why? Firstly, because Arsenal have been dominant at home this season. Unai Emery's side have won their past nine Premier League games at Emirates Stadium and have only dropped points in draws against Liverpool and Wolves since losing to Manchester City on the opening day of the season. Secondly, because Newcastle have a poor record against Arsenal and particularly on their trips to London. The Magpies have lost their past six league visits to the Emirates, conceding 18 goals in the process and scoring just five times, while their trips to the capital generally are not much fun. Newcastle have lost 17 of their last 23 away Premier League games in London, winning three and drawing three, and are winless in their last six trips down the A1/East Coast mainline. Bearing all of that in mind, Gunners striker Alexandre Lacazette might catch your eye. That's because the Frenchman has scored 73% of his Premier League goals for Arsenal in home games - 19 goals in 26 matches - and has also made more assists this season (11) than any other player. While Arsenal have not been defensively sound this season, centre-back Laurent Koscielny has bagged three goals in his past six league starts and left wing-back Saed Kolasinac has been back among the assists. Chelsea's Eden Hazard has scored five Premier League goals in three appearances against Cardiff. Southampton striker Charlie Austin has scored seven goals in all competitions against Saturday's opponents Brighton - that is more than against any other side since his debut in the Football League in October 2009. Manuel Lanzini has scored three Premier League goals in three home appearances for West Ham against Everton. Luka Milivojevic has scored 45% of Crystal Palace's home Premier League goals this season - that's five of Palace's 11. Since his debut for Fulham in January, Ryan Babel has been involved in more Premier League goals than any other Cottagers player - two goals, two assists.